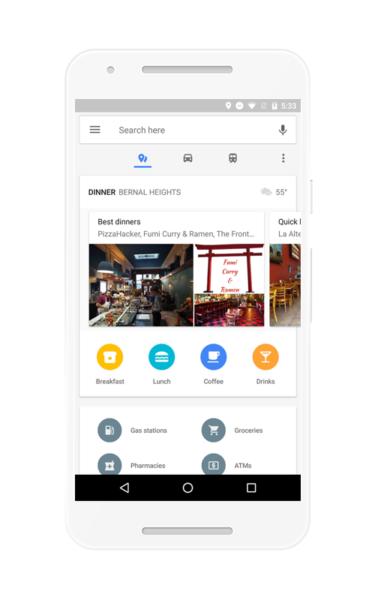 Google is aiming at streamlining features on its Google Maps service. The tech giant has rolled out an update for Google Maps that puts all the essential features at one place so that users don’t have to keep switching from using specific features. You will now get all the features at one swipe from the Home screen. All the information such as current traffic stats, ETA from office to home, transit data, nearby ATMs, pharmacies, eateries, and much more will be shown on the page. As soon as you swipe from the Home screen, you will find three new tabs – Traffic, Places, and Transit. Names of these tabs are self-explanatory and will show the information likewise. 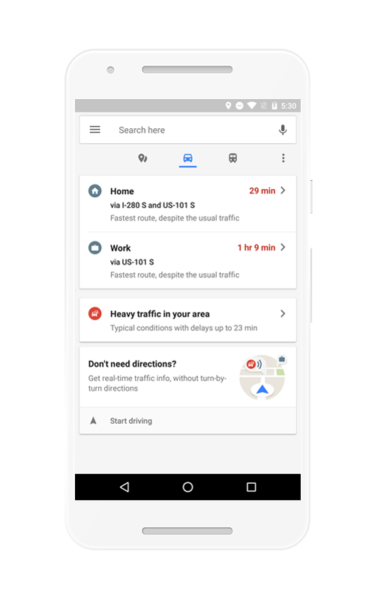 Explaining the motto behind the new interface, Google writes in its blog post that it provides “helpful everyday info” in real-time based on user’s current location. Most of these features have been there on Google Maps, but the new interface has stacked them at one place so that they will become handier for the users. For now, the new update for Google Maps is being rolled out to Android devices. It will soon be rolled out for iOS users too, but Google has not specified a timeline for that yet. The “Places” tab will show restaurants and drink venues nearby – spread across sub-categories like “best dinners,” “cheap eats,” “business dining” and others. Such kind of information display is not entirely new as Google had been working on it for a year and had already rolled it out for major metros like London, New York, and San Francisco under the “Explore” tab on Google Maps. The tab also shows other vital information like ATMs, gas stations, pharmacies, grocery shops, and others. Along with this information, you will also be able to read about the neighbourhood and businesses in the surrounding area. On the contrary, the ‘Traffic” tab shows the real-time information such as traffic congestion, ETA from one place to another (saved addresses such as Home, Work, and others). Another nifty feature is the one that does not show direction but alerts about delays on the route. This feature would come handy when you know the direction but would like to be informed about the traffic condition en route. To use it, you just need to tap on “Start Driving,” and Google Maps will keep alerting if there are delays on your way. The “Transit” tab shows the schedule for public transportation such as Trains and Buses. In this tab, you will get all the information like – which bus/train to take to reach a particular destination or how much time it would take to drop you at the destination. If you want to change the destination, simply swipe down, and it will show you nearby bus/train station with the schedule in real-time. With this new update, Google Maps sure looks more accessible and helpful. The update for Android users will start rolling from today.